ALL MY BURKART PRICES ARE EQUAL TO THE TAX-FREE BURKART FACTORY PRICE (USA) + 5% IMPORT- AND CUSTOMS COSTS TO THE NETHERLANDS. Your attention: All Burkart instruments must be sold/bought with an original and signed Burkart Certificate of Authenticity & Warranty! 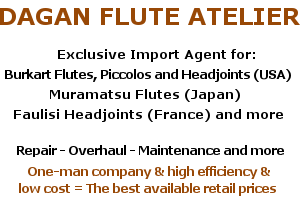 RESONA FLUTES – A step-up Burkart flute for advancing players. Resona Flute Model 300 – .018” solid silver tubing, embouchure, rings, ribs & posts, silver plated keys. All my-prices above are tax-free in US$ currency and are subject to change without notice, unless already invoiced. For flutists who aren’t familiar with the mechanical codes I list them here below.